The current conflict in Syria has been an extremely contentious topic these past few weeks. 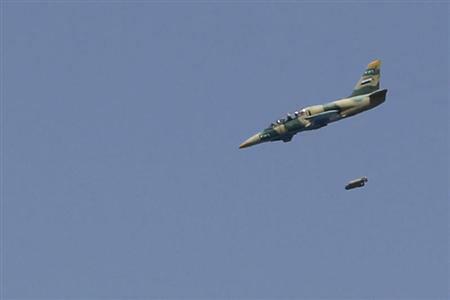 Above is an image taken by a Reuters photographer of an L-39 Albatros of the Syrian Air Force dropping what seem to be cluster bombs on a rebel position, circa 2012. What’s interesting is that the L-39 was created as a trainer aircraft, just like the Yak-130/M-346, built to give future fighter and attack pilots an introduction to the jets they’ll eventually be flying. Therefore, the L-39 has been designed such that it is able to mimic the handling characteristics and various behaviors of these aircraft and it’s also able to carry a small weapons payload for practice. Poorer nations unable to afford the purchase and upkeep of dedicated ground-attack aircraft circumvent the issue of not possessing what has become a staple of air forces worldwide by buying cheap refitted L-39 trainers and having them re-tasked to attack roles. In this case, Syrian Albatrosses have evidently been repurposed as attack “COIN” (counter-insurgency) aircraft by the SyAAF. However, it’s known that Syria does maintain a fleet of Soviet-era Sukhoi and MiG attack aircraft in its Air Force’s inventory. L-39s seem have taken a larger role in the conflict, probably because they are easy on parts and the wallet when it comes to maintenance and flight, while their larger Su/MiG counterparts are the polar opposite.